Kevin Michael Godley (born 7 October 1945, Prestwich, Lancashire, England) is an English musician and music video director. He is known as the drummer of the art rock band 10cc and for his collaboration outside the band with Lol Creme. He was born into a Jewish family, and went to North Cestrian Grammar School in Altrincham. The first band he was part of was Group 17 which had its origins in the Jewish Lads Brigade (JLB). The members were Henri Shalam, Bernard Sufrin, Sydney Kaye and Jeffrey Baker. While attending art college in Manchester Godley met Lol Creme. They became part of several bands, most notably Hotlegs and 10cc. He and Creme left 10cc in 1977, early into the recording of the album Deceptive Bends, unimpressed with the songs by bandmates Eric Stewart and Graham Gouldman and eager to work on other projects outside of the band. 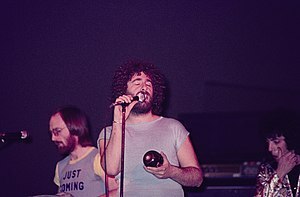 After leaving 10cc the two became known as Godley & Creme, both as musicians and film directors. They were jointly nominated for a Grammy Award for Best Music Video, Long Form for: The Police: Synchronicity Concert in 1986. Godley writes and sings, and he plays drums, percussion and keyboards. In 1990, his charity production One World One Voice was released on CD in the UK. It was a CD that focused on environmental and ecological crises. Recently, Godley has moved into developing a music platform for the iPad, that combines audio and video to create a global recording studio in the cloud called "WholeWorldBand". The company was nominated for the "SXSW Music Accelerator Award" in 2013 and was one of eight finalists selected from a pool of over 500. In 2017, Godley publicly invited musicians to send him music to work on a solo album. Godley was awarded an honorary Doctorate of Arts by Staffordshire University in 2018. Godley currently lives in Dublin, Ireland. Since he split from his long-time working partner Creme, Godley forged a career directing music videos and films on his own. Fine Young Cannibals – "Don't Look Back"
Band Aid 2 – "Do They Know It's Christmas?" Wet Wet Wet – "Sweet Surrender"
Bryan Adams – "Can't Stop This Thing We Started"
Bryan Adams – "Though I'd Died and Gone to Heaven"
Bryan Adams – "All I Want Is You"
U2 – "Even Better Than the Real Thing"
Garland Jeffreys – "The Answer"
Moodswings & Chrissie Hynde – "Spiritual High"
Frank Sinatra & Bono – "I've Got You Under My Skin"
Paul McCartney – "C'Mon People"
Sting – "Fields of Gold"
Blur – "Girls & Boys"
Bono & Gavin Friday – "In the Name of the Father"
Dave Stewart – "Heart of Stone"
Larry Adler & Kate Bush – "The Man I Love"
Deep Forest – "Deep Forest"
Whale – "I'll Do Ya"
Adam Clayton & Larry Mullen Jr. – "Theme from Mission: Impossible"
Gavin Friday – "You, Me and World War Three"
Phil Collins – "Dance into the Light"
The Beatles – "Real Love"
Forest for the Trees – "Dream"
Jean-Michel Jarre – "Oxygène Part 8"
Boyzone – "When the Going Gets Tough"
Boyzone – "You Needed Me"
Eric Clapton – "My Father's Eyes"
Helicopter Girl – "Subliminal Punk"
Kele Le Roc – "My Love"
Phil Collins – "You'll Be in My Heart"
Sting – "After the Rain Has Fallen"
The Black Crowes – "By Your Side"
Ronan Keating – "When You Say Nothing at All"
Wyclef Jean featuring Bono – "New Day"
Alabama 3 – "Woke Up This Morning"
Rod Stewart – "Run Back into Your Arms"
Marti Pellow – "Close To You"
Zucchero – "I'm in Trouble"
Ronan Keating – "If Tomorrow Never Comes"
Ronan Keating – "We've Got Tonight"
Scarface featuring Faith Evans – "Someday"
The Charlatans – "A Man Needs to Be Told"
The Rapture – "Sister Saviour"
Will Young – "Leave Right Now"
Haven – "Wouldn't Change a Thing"
Lisa Stansfield – "Treat Me Like a Woman"
Ronan Keating – "Father and Son"
The Corrs – "Summer Sunshine"
Katie Melua – "Nine Million Bicycles"
Katie Melua – "I Cried for You"
Jamie Cullum – "Mind Trick"
Shayne Ward – "That's My Goal"
Keane – "Is It Any Wonder?" Mojo Fury – "The Man"
Snow Patrol – "Crack the Shutters"
Katie Melua – "The Flood"
^ "Kevin Godley | Songs". AllMusic. 1945-10-07. Retrieved 2014-08-09. ^ Lol Creme interview, Uncut, December 14, 1997 Archived 20 August 2008 at the Wayback Machine. ^ "GG/06". gg06.co.uk. Archived from the original on 12 February 2008. Retrieved 9 August 2014. ^ "WholeWorldBand". WholeWorldBand. Retrieved 2014-08-09. ^ "WholeWorldBand: SXSW Accelerator award finalist | Music | News". Hot Press. Retrieved 2014-08-09. ^ Guttridge, Richard (6 June 2018). "10cc star to be honoured by Staffordshire University". Express & Star. Retrieved 21 August 2018. ^ O'Rourke, Frances. "First encounters: Kevin Godley and Sulinna Ong". The Irish Times. Retrieved 2 January 2019.